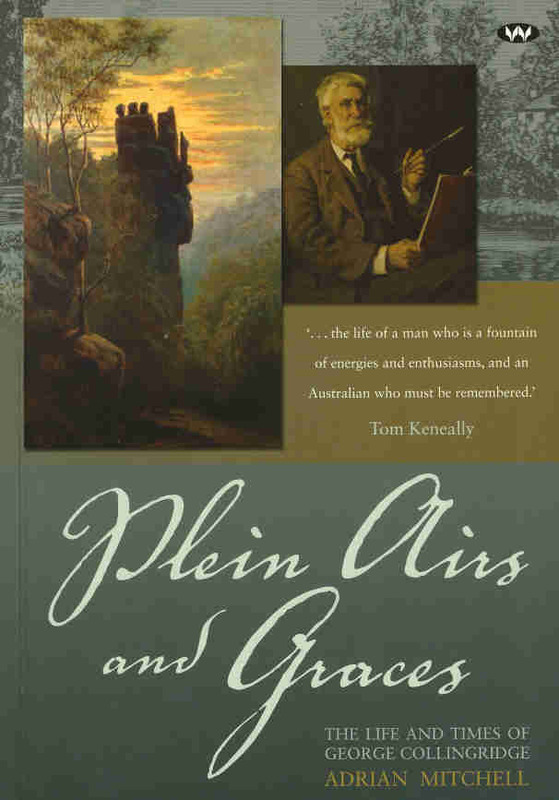 In Plein Airs and Graces Adrian Mitchell has done a great job in successfully bringing to life the story, and remarkable life, of accomplished pre-impressionist landscape painter George Collingridge de Tourcey. However calling Collingridge a landscape painter is doing an injustice to a man who had many other talents. He was also an accomplished woodblock engraver, his first trade, decorated Papal Zouave, multilingual historical cartographer, historian, successful activist, art teacher, photo-engraver, zincographer, language teacher, newspaper, journal and magazine proprietor, author, editor, printer and publisher. George Alphonse Collingridge de Tourcey was born on 29 October 1842 at Godington Manor, Oxfordshire, England and was destined, not only to lead an extraordinarily rich and colourful life, but also make a substantial contribution to Australian cultural history. In 1853 the Collingridge family moved to France, which was the start of George’s life of cultural acclimatisation. He would live in Paris, London, Rome, Madrid and finally in Sydney where he arrived on board the Lusitania on 24 January 1879. After finishing his education he attended classes in drawing and later landscape painting, using both oil and water colour. He made trees his particular subject, though he preferred to paint them en masse, not as individual studies of the later Hans Heysen manner. It was French painter Corot who taught him to paint outdoors, en plein air, a practice just coming into widespread fashion after the invention of tubes of paint, which did away with the necessity of mixing oil paints. George would paint for the rest of his life. In June 1865 George enlisted in the Zouaves, the Papal fighting force, as his brother Alfred had done before him. During his two years’ service, mainly in Rome, he saw plenty of action and was three times decorated. After his discharge from the Zouaves he continued his painting in Italy but after some months returned to Paris to take up his previous profession as wood engraver. By 1871 he was back in England where painting and wood engraving were intermixed by still more travelling. All the while he longed for somewhere closer to nature, somewhere picturesque where he could sketch and paint. Where better than Australia where his brother Arthur worked for the Illustrated Sydney News and brother Charles had joined the Jesuits at Sevenhill. George was shown around Sydney by Arthur and in August visited Richmond and Windsor where he made a number of sketches to be turned into paintings at a later stage. His main source of income was his job at the Illustrated Sydney News. He had found his paradise he had hoped for when he left Europe and had taken up residence at Hornsby, near Sydney. He soon declared France and Australia the two most civilised countries in the world. While being occupied preparing woodblocks of illustrated material for the regular press and other major publications he still found time painting scenes of Sydney harbour. He gave preference to the largely untouched bush, the distant valleys and waterways of Sydney’s northern reaches, where the evidence of settlement was still at a minimum. At the 1879 Exhibition for Xylography he won a gold medal. He had become a ‘first class woodpecker’. Unfortunately his woodpecker’s skill and labour was all but wiped out after the invention of photographic processes. Naturally George did not like this new medium which put him out of a job and income and made his expertise redundant. As with his style of painting, which was slowly replaced by the new Impressionists, he persevered with wood engraving to the end of his life. When the Art Society of New South Wales was formed in 1880, he exhibited ten paintings at its first show. With his English and French cultural heritage George was soon busying himself fostering the art community in Sydney and promoting progress associations. He would later be elected Vice-President of the Institute de Conversation Françise, the precursor of Alliance Françise. However, his boundless energies allowed for much more activity and interests. He conducted classes in painting, French conversation and Esperanto. He set up house, Capo di Monte, at Berowra Creek, married Lucy Makinson on 23 November 1882 and eventually had four sons and two daughters. After the death of his father in Paris in 1885, George and Arthur arranged for their mother and sister Mary to migrate to Sydney. Although George loved the bush, in 1887 he moved closer to the city to be nearer fellow painters and other artists, but most of all to have easy access to the library. The library had become an important source for his research into his hypothesis about the early European discovery of Australia. His research proved a very costly exercise as he paid large sums of money to buy books from all over the world to check or find information not available in the Sydney library. To finance his project he taught whenever and wherever the opportunity presented itself. He taught for 25 years at the Barker College, 10 years at Sydney Technical College and 8 years at Hornsby Technical College. And still he found time to write and publish a set of correspondence drawing lessons. His painting efforts were rewarded in 1886 when he won the prize for painting in the Colonial and Indian Exhibition in London. This was followed by editing Australian Art in 1888, an article titled The First Discoverers of Australia in 1890 and numerous other articles in the Illustrated Sydney News, French and even American publications. During these years he also taught himself historical geography and cartography which together with his research resulted in 1895 in his 376 page Magnum Opus, The Discovery of Australia. Its subtitle being; A Critical, Documentary and Historic Investigation Concerning the Priority of Discovery in Australasia by Europeans before the arrival of Lieut. James Cook, in the ‘Endeavour’, in the year 1770. With Illustrations, Charts, Maps, Diagrams, &c. Copious Notes, References, Geographical Index and Index to Names. In it he strongly argued that it was the Portuguese who discovered Australia. In fact it could have been anyone, except the Dutch, whose claim and evidence he almost ridiculed. As late as 1916 he stood by his convictions by demeaning some of the Dutch discoveries in Western Australia. After 1917 his writings came under attack, particularly by Professor Arnold Wood of the University of Sydney. However the same book earned him a Knighthood in 1908 from the King of Portugal making him a Knight Commander of the Order of St James of the Sword in recognition of his work in identifying the early Portuguese with the discovery of Australia. His second Knighthood was Knight Commander of the Spanish Royal American Order of Isabel la Catolica. During the 1890s, while working on the Discovery of Australia he launched ‘Progress’, the first newspaper in the district. He finished the building of his new house, Jave la Grande, made sketches, painted, wrote, gave lessons and exhibited his paintings regularly. George believed in the future accomplishment and prosperity of Australia and did everything in his power to bring that about. He was tireless in rambling through the valleys and along the ridges, criss-crossing the district in search of items for his local paper and spotting vantage points for paintings and sketches. As early as 1892 he helped form the Hornsby Progress Association and was on the committee of the Hornsby School of Art. He was successful in orchestrating petitions for railway stations, roads and extension of postal services. In 1894 he set up his own publishing premises. After the publication of his Magnum Opus in 1895 he continued unabated with his teaching, writing, publishing and other commitments. In 1908 he founded the first Esperanto club in Australia at Gosford. A year later he was made a honorary member of the Royal Historical Society. During 1911 the Collingridge family left Hornsby for Narara on a property they called Godington which was near their son’s property. However they kept Jave la Grande but rented it out for the time being. George still continued with his writing and teaching, travelling by train to Hornsby until 1913 when he got a job teaching at the Gosford School for Girls. At the age of 68 he took up an appointment as lecturer at the Sydney Technical College and remained there for the next ten years. Even at this age he kept writing about the early discovery of Australia and published still more material including some children’s literature. In 1924 he published Berowra, the Unsolved Riddle of its Amazing Ridge. It was illustrated with his own woodcuts. Two years later at the age of 79 he exhibited for the last time with a collection of his oils and water colours, which was opened by former Prime Minister WH Hughes. Collingridge died on 1 June 1931 and was buried in the Catholic section of the Field of Mars cemetery. He was survived by three sons and one daughter. After reading Adrian Mitchell’s interesting and well researched account of the life story of George Collingridge, who as it turns out, was quite a public figure but didn’t live according to the prevailing conventions, it is hard to understand why a man of such diverse qualities and energy, and receiver of two Knighthoods and three bravery medals has been overlooked for such a long time and his name all but forgotten. Prime Minister Julia Gillard and Arts Minister Tony Burke have announced the 2013 Prime Minister’s Literary Awards shortlists. Now in their sixth year, the 2013 shortlists recognise the best in Australian fiction, poetry, non-fiction, history, young adult and children’s fiction published in 2012. It includes Plein Airs and Graces. A tax free prize of $80,000 will be awarded to the winner of each of the award categories. Shortlisted entries receive $5,000 tax free. includes colour and black and white photographs, end notes, bibliography and index.